아리조나에 있는 공립 고등학교의 2015년 학교별 SAT 성적 순위가 발표되었습니다. 사립과 Charter School 을 제외한 공립학교 중 10위권에 있는 학교들이 위치한 지역을 지도로 보실 수 있습니다. 1위를 차지한 학교가 Peoria 에 있고 나머지 학교들이 South East Valley 에 많이 있다는 점이 주목됩니다. 특히 지도에는 나와있지 않지만 Charter School 들이 SAT 성적에서 두드러진 성과를 보이고 있습니다. Basis Peoria, Basis Scottsdale, Basis Chandler, Basis Phoenix 가 최고의 성적을 나타내고 있고 Great Hearts Academy 에 속한 학교들도 좋은 성적을 거두고 있습니다. 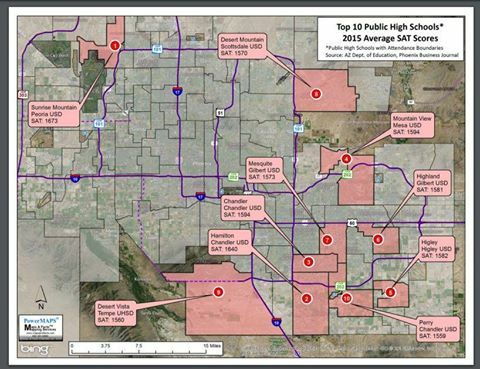 Here is the list of top 50 public high schools in Arizona, ranked by 2015 SAT score.